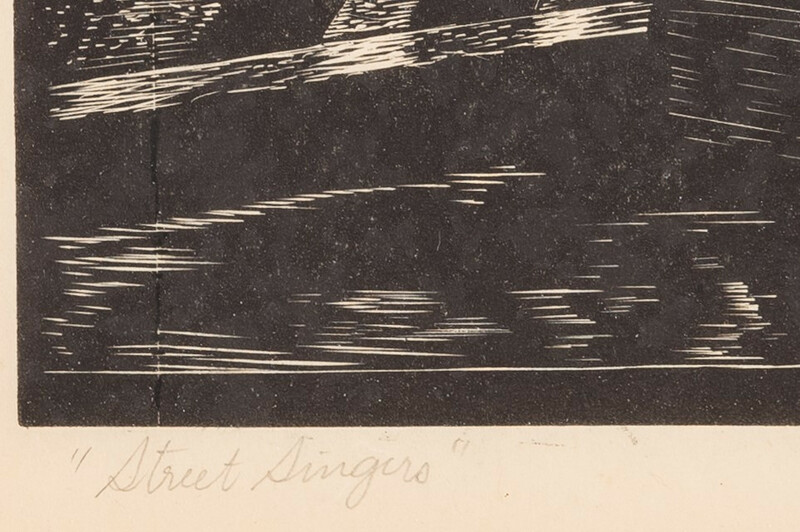 Ernest Pickup (Tennessee, 1887-1970) woodcut, titled lower left in pencil "Street Singers" (also known as "Joy to the World"); numbered EA/50 and signed lower right and dated "Ernest Pickup '39". 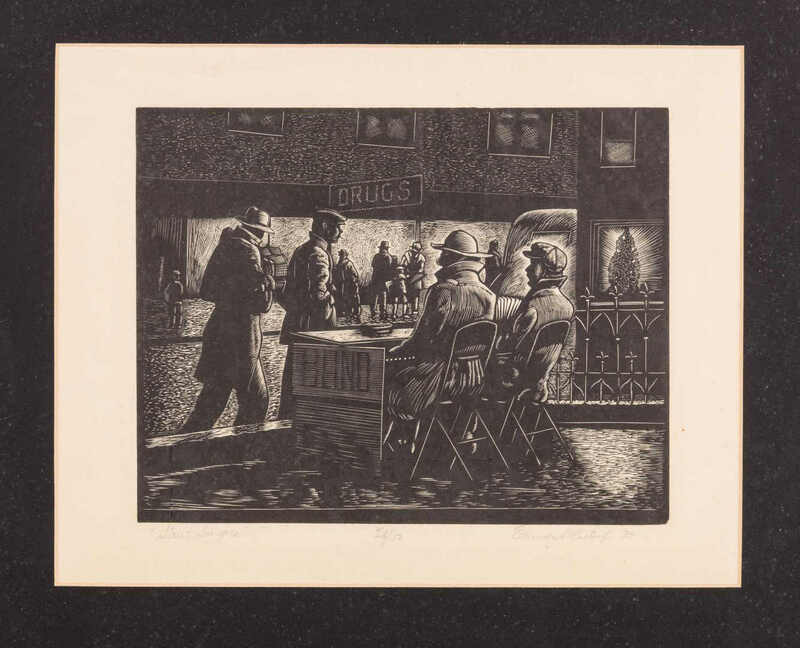 Depicts 2 men seated, with their backs to the viewers, behind a table with sign marked "Blind" as figures walk past them on the street. A store sign, "Drugs", a decorative iron fence, and a Christmas Tree, are visible in the background. 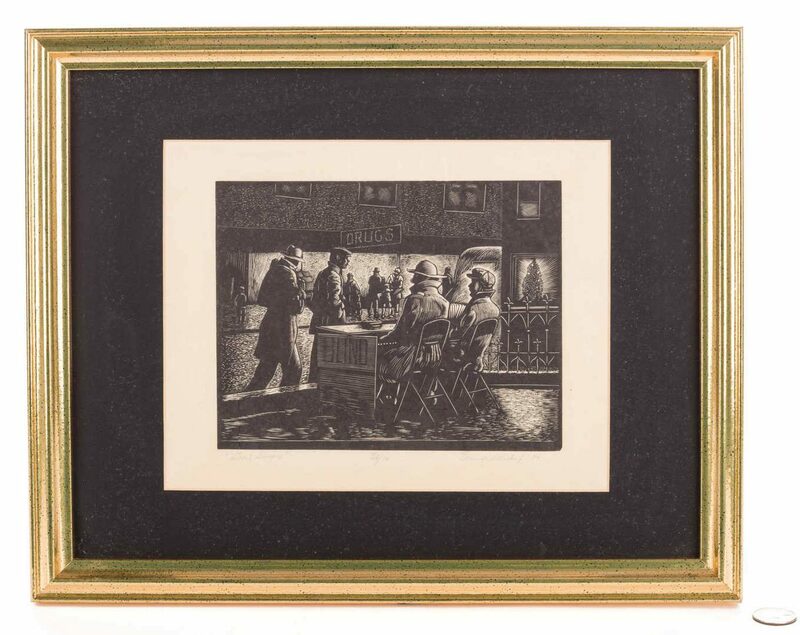 Housed in a molded giltwood frame with black matte. Image – 6" H x 7 1/3" W. Sight – 9 1/2" H x 7 1/2" W. Framed – 12 1/2" H x 15 1/4" W. American, mid 20th century. Provenance: Middle Tennessee collection. 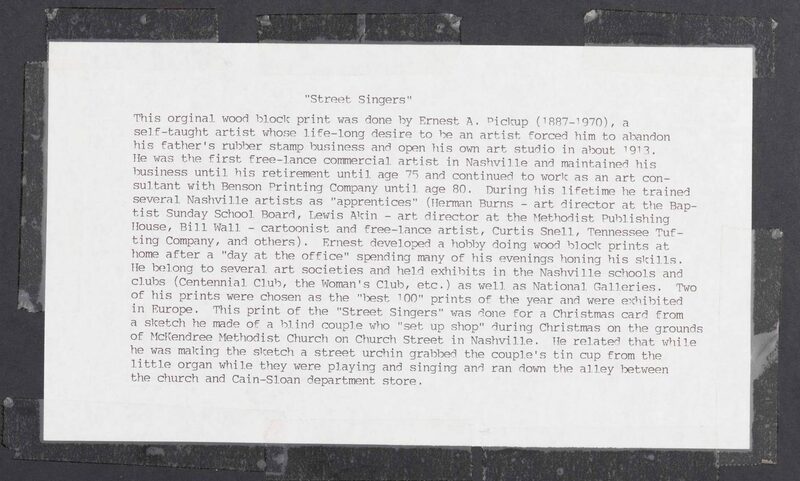 Biography (courtesy Nashville Arts Magazine): "Ernest A. 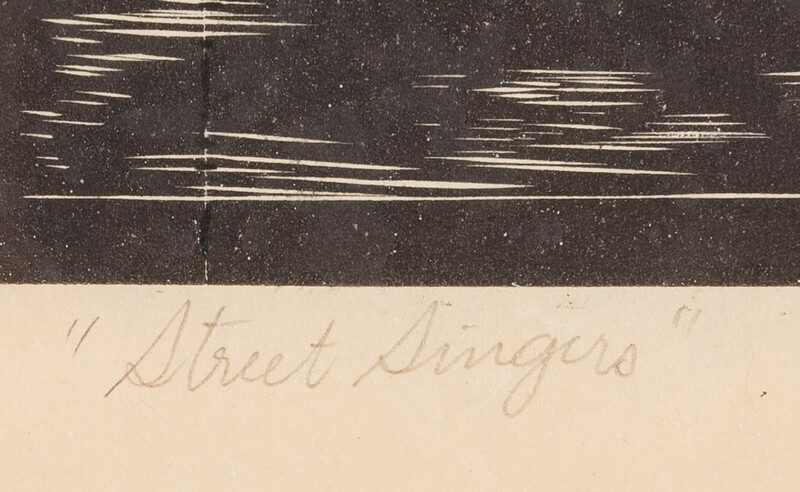 Pickup, born in Shelbyville, Tennessee, in 1887, was among the first printmakers and commercial artists working in Nashville, as well as the first commercial artist in Tennessee with his own office. 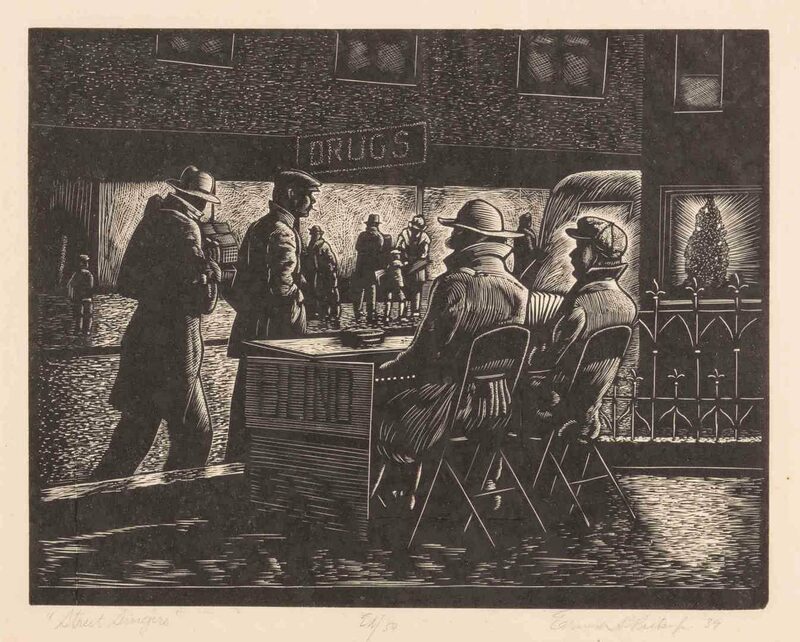 He is best known for his woodcuts, a medium through which he faithfully rendered many cultural landmarks in and around Nashville. When the Depression impeded his commercial art career, he began focusing on his wooducts. During this time he took part in group exhibitions across the United States, such as the Exhibition of Lithographs, Woodcuts, and Block Prints held in New York City in January of 1937. 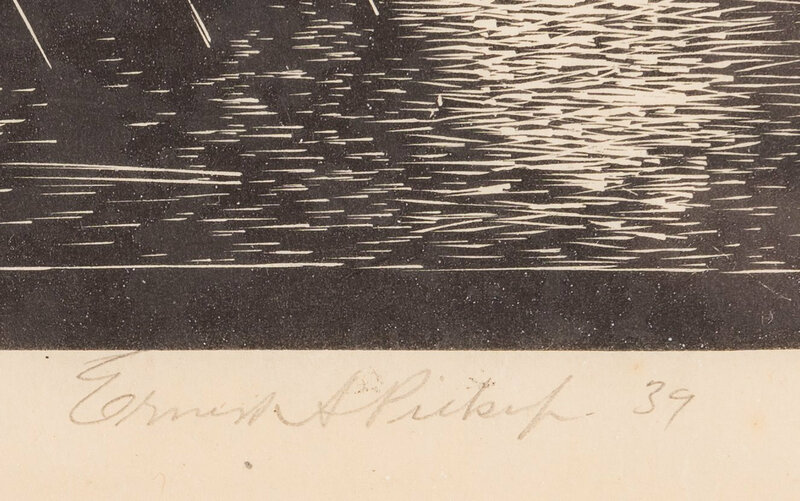 From that show, one of his etchings was selected to travel with the Society of American Etchers, which toured European Galleries, starting in Stockholm, Sweden, in the winter of 1937. 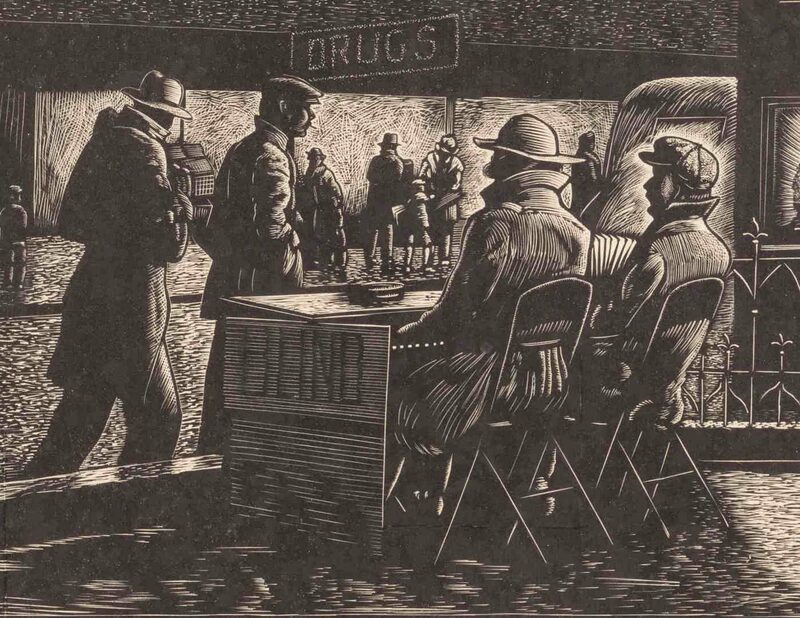 In that same year, Mr. Pickup's work was also featured at the Sixth International Exhibition of Lithography and Wood Engraving, held at the Art Institute of Chicago, and he was once again featured internationally at an exhibition held in Scotland in 1939". CONDITION: Light toning and creasing. Not examined out of frame.